A Spinal Cord Injury occurs when trauma or disease damages the spinal cord and results in partial or complete paralysis. The level of paralysis is determined by where the damage occurs, i.e. in the neck or in the back. Besides paralysis, patients with Complete Spinal Cord Injury suffer from other devastating symptoms such as sensory loss, incontinence, pain and pressure sores. The injury results in poor quality of life and high costs for the society. Complete Spinal Cord Injury is a condition for which there is no treatment available today. The number of patient cases in a certain population for a limited time varies between 12.7 and 44.3 per million inhabitants depending on the country. Of these 40 percent are complete injuries. The patients are often young men involved in accidents. To repair the permanently injured spinal cord has been a huge challenge. The poor prognosis in combination with absence of effective treatments to restore functional loss has caused communities and governments to focus attention on the provision of basic and essential long-term care services. BioArctic has developed an innovative combination of a medical device and a drug, the growth factor FGF1 to treat Complete Spinal Cord Injury. BioArctic’s innovative potential regenerative treatment concept, SC0806, consists of a biodegradable device with an adjunctive drug Fibroblast Growth Factor 1 (FGF1) that stimulates nerve regeneration and reduces scar formation. The project is inlicensed from Swenora Biotech AB and is based on innovative research at Karolinska Institutet and Karolinska University Hospital, Sweden. The treatment includes a surgical procedure in which a degradable implant containing peripheral nerves and growth factor FGF1 are operated into the damaged spinal cord to cause nerve regeneration (overgrowth) of nerve pathways over the area of injury. The device supports the guiding and regeneration of nerves and provides high anatomical precision in the surgical procedure, which aims at functional improvement of significant medical importance. The surgery is then followed by 18 months of rehabilitation. Preclinical results show regeneration, improved electrophysiology and motor function. This new treatment has the potential to provide a treatment for patients with Complete Spinal Cord Injury, which aims to improve the patients’ function and quality of life. BioArctic’s Phase 1/2 clinical trial is currently ongoing. Patients in the first cohort have received treatment with SC0806 with subsequent rehabilitation for 18 months. There are also rehabilitation control patients included in the clinical study. Work is currently ongoing to expand the study to include patients from rehabilitation clinics in Finland, Estonia and Norway. The product obtained orphan drug status in 2010 in the EU and in 2011 in the US. 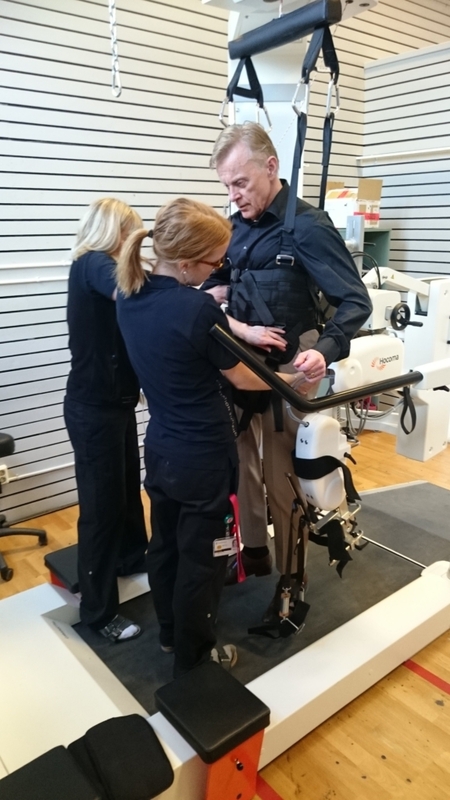 Robotic training used for rehabilitation. (Photo: BioArctic AB). We are committed to help patients with Complete Spinal Cord Injury. SC0806 has received funding from the European Union’s Horizon2020 Research and Innovation Program under Grant Agreement No. 643853 to perform a clinical study.